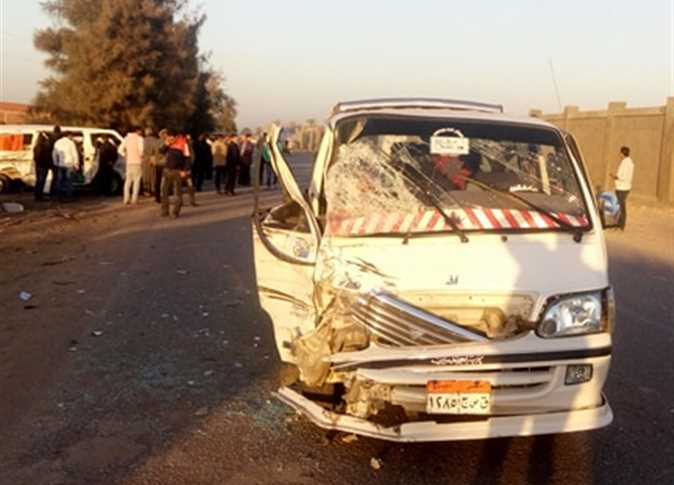 A woman was killed and eight people were injured in a collision between three cars on the International Coastal Road in Beheira governorate, near Kafr al-Dawar city. A statement from the Beheira Security Directorate said that the accident occurred when the right rear tire of a car exploded on the road, causing the driver to lose control on the steering wheel where it collided with a lamppost and broke the barrier into the opposite direction, crashing into a another car and causing that lamppost to fall onto a microbus. The accident resulted in the death of the 22-year old student driver of the second car, and injuring eight passengers of the three cars, leaving them with bruises and suspicion of fractures and post-concussion. Egypt has a road traffic fatality rate of 42 deaths per 100,000 people, according to the World Health Organization. The majority (48 percent) of those killed are passengers of four-wheeled automobiles, although pedestrians also constitute a significant proportion (20 percent) of these fatalities. According to a report by the Central Agency for Public Mobilization and Statistics on accidents in 2017, car accidents on roads resulted in 3,747 deaths, 13,998 injuries, and 17,201 damaged vehicles during that year. The report added that the primary cause of accidents was the human factor, which accounted for 78.9 percent of total accidents, followed by defects in the vehicle at 14 percent and environmental causes (such as road conditions) at two percent of total accidents.